You cannot know the history of silent film unless you know the face of Renee Maria Falconetti. In a medium without words, where the filmmakers believed that the camera captured the essence of characters through their faces, to see Falconetti in Dreyer's "The Passion of Joan of Arc” (1928) is to look into eyes that will never leave you. Falconetti (as she is always called) made only this single movie. "It may be the finest performance ever recorded on film,” wrote Pauline Kael. She was an actress in Paris when she was seen on the stage of a little boulevard theater by Carl Theodor Dreyer (1889-1968), the Dane who was one of the greatest early directors. It was a light comedy, he recalled, but there was something in her face that struck him: "There was a soul behind that facade.” He did screen tests without makeup, and found what he sought, a woman who embodied simplicity, character and suffering. Dreyer had been given a large budget and a screenplay by his French producers, but he threw out the screenplay and turned instead to the transcripts of Joan's trial. They told the story that has become a legend: of how a simple country maid from Orleans, dressed as a boy, led the French troops in their defeat of the British occupation forces. How she was captured by French loyal to the British and brought before a church court, where her belief that she had been inspired by heavenly visions led to charges of heresy. There were 29 cross-examinations, combined with torture, before Joan was burned at the stake in 1431. Dreyer combined them into one inquisition, in which the judges, their faces twisted with their fear of her courage, loomed over her with shouts and accusations. If you go to the Danish Film Museum in Copenhagen you can see Dreyer's model for the extraordinary set he built for the film. He wanted it all in one piece (with movable walls for the cameras), and he began with towers at four corners, linked with concrete walls so thick they could support the actors and equipment. Inside the enclosure were chapels, houses and the ecclesiastical court, built according to a weird geometry that put windows and doors out of plumb with one another and created discordant visual harmonies (the film was made at the height of German Expressionism and the French avant-garde movement in art). Instead Dreyer cuts the film into a series of startling images. The prison guards and the ecclesiastics on the court are seen in high contrast, often from a low angle, and although there are often sharp architectural angles behind them, we are not sure exactly what the scale is (are the windows and walls near or far?). Bordwell's book reproduces a shot of three priests, presumably lined up from front to back, but shot in such a way that their heads seem stacked on top of one another. All of the faces of the inquisitors are shot in bright light, without makeup, so that the crevices and flaws of the skin seem to reflect a diseased inner life. Falconetti, by contrast, is shot in softer grays, rather than blacks and whites. Also without makeup, she seems solemn and consumed by inner conviction. Consider an exchange where a judge asks her whether St. Michael actually spoke to her. Her impassive face seems to suggest that whatever happened between Michael and herself was so far beyond the scope of the question that no answer is conceivable. Why did Dreyer fragment his space, disorient the visual sense and shoot in closeup? I think he wanted to avoid the picturesque temptations of a historical drama. There is no scenery here, aside from walls and arches. Nothing was put in to look pretty. You do not leave discussing the costumes (although they are all authentic). The emphasis on the faces insists that these very people did what they did. Dreyer strips the church court of its ritual and righteousness and betrays its members as fleshy hypocrites in the pay of the British; their narrow eyes and mean mouths assault Joan's sanctity. For Falconetti, the performance was an ordeal. Legends from the set tell of Dreyer forcing her to kneel painfully on stone and then wipe all expression from her face--so that the viewer would read suppressed or inner pain. He filmed the same shots again and again, hoping that in the editing room he could find exactly the right nuance in her facial expression. There is an echo in the famous methods of the French director Robert Bresson, who in his own 1962 "The Trial of Joan of Arc” put actors through the same shots again and again, until all apparent emotion was stripped from their performances. In his book on Dreyer, Tom Milne quotes the director: "When a child suddenly sees an onrushing train in front of him, the expression on his face is spontaneous. By this I don't mean the feeling in it (which in this case is sudden fear), but the fact that the face is completely uninhibited.” That is the impression he wanted from Falconetti. That he got it is generally agreed. Perhaps it helps that Falconetti never made another movie (she died in Buenos Aires, Argentina, in 1946). We do not have her face in other roles to compare with her face here, and the movie seems to exist outside time (the French director Jean Cocteau famously said it played like "an historical document from an era in which the cinema didn't exist”). 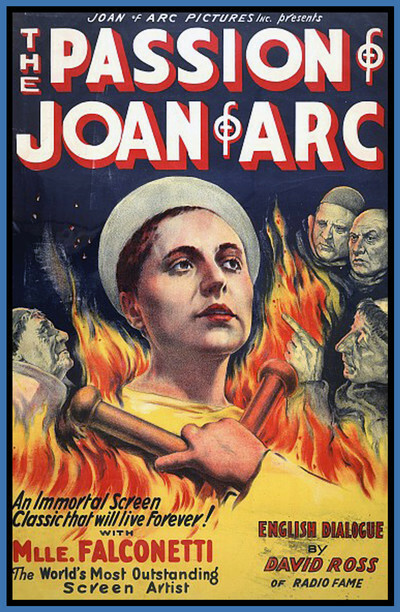 To modern audiences, raised on films where emotion is conveyed by dialogue and action more than by faces, a film like "The Passion of Joan of Arc” is an unsettling experience--so intimate we fear we will discover more secrets than we desire. Our sympathy is engaged so powerfully with Joan that Dreyer's visual methods--his angles, his cutting, his closeups--don't play like stylistic choices, but like the fragments of Joan's experience. Exhausted, starving, cold, in constant fear, only 19 when she died, she lives in a nightmare where the faces of her tormentors rise up like spectral demons. Perhaps the secret of Dreyer's success is that he asked himself, "What is this story really about?” And after he answered that question he made a movie about absolutely nothing else. This is part of his undertaking to watch and write about every film in the Criterion Collection.